During an eye exam, your eye practitioner will ask you to find the smallest line of text letters that you can make out, and ask you to read it. If you can read the bottom row of letters, your visual acuity is very good. You have 20/20 vision. In the day, the standard placement of an eye chart was on a wall and placed 20 feet away from your eyes. Since many practitioners offices don't have rooms that are 20 feet long, in a smaller room the eye chart used to hang behind the patient chair, using mirrors to make it appear in front of you at a simulated distance of 20 feet. In this day and age we use projectors that are calibrated to simulate a distance of 20 feet. 20/20 vision (or really, 20/20 visual acuity) is considered "normal" vision, meaning you can read at a distance of 20 feet a letter that most people should be able to read at 20 feet. The first number is the distance in feet between the subject and the eye chart. The second number is the distance from which a norm was set that an average person can read. 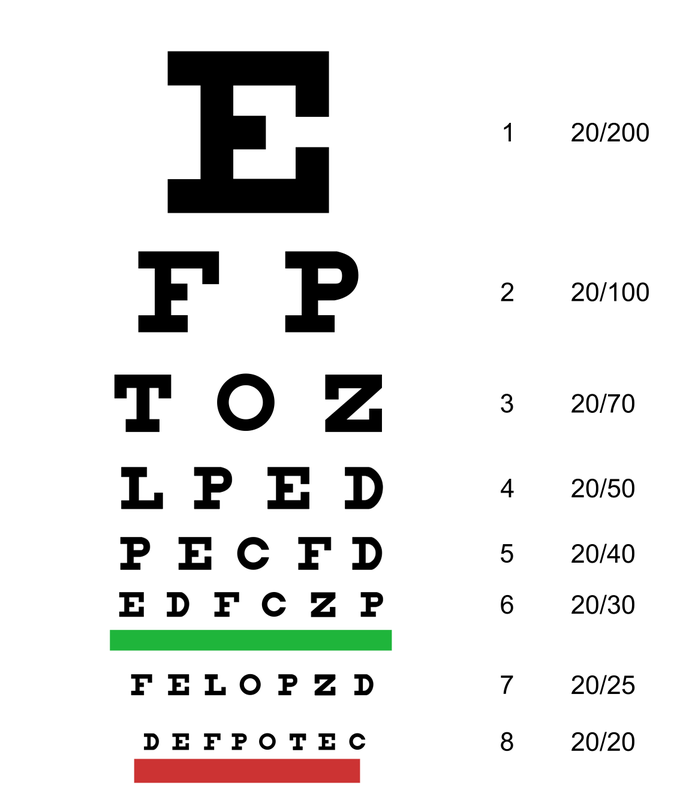 Eye charts can be configured in various ways, but generally, if you can read the big E at the top but none of the letters lower than that, your vision is considered 20/200. That means you can read at 20 feet a letter that people with "normal" vision can read at 200 feet. So at 20/200, your visual acuity is very poor. Here in South Africa we calculate in metres. So the visual acuity is measured at 6 meters instead of 20 feet. So if your visual acuity is 6/6 that equals 20/20.